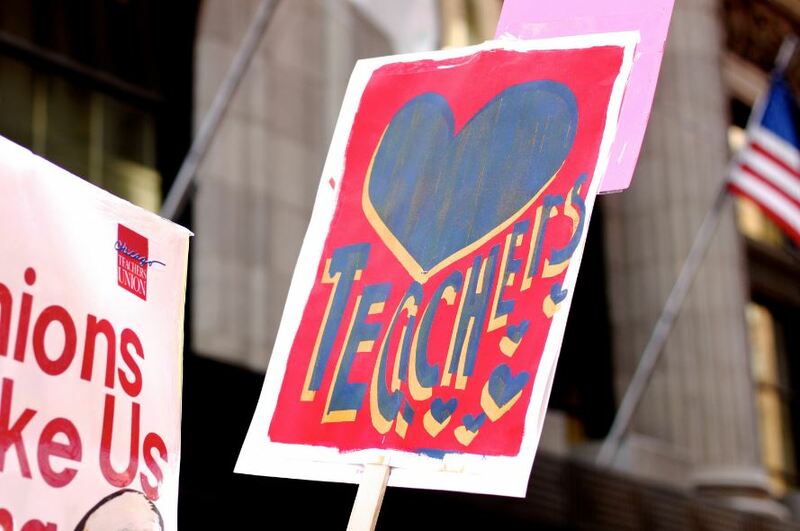 How austerity and the Chicago Teachers Union have fostered a culture of solidarity between parents and educators. From its “Renaissance 2010” school reform plan in the 2000s to the 2013 shutdown of fifty neighborhood schools to the endless rounds of budget cuts and layoffs, the city of Chicago has carried out one of the most brutal public-education austerity programs in the country. Poor neighborhoods of color have borne the brunt of such cuts, but they have also begun spreading to the city’s wealthier neighborhoods. In the process, and as a result of the organizing of groups like Raise Your Hand, some parents and community members in predominantly white, middle- to upper-class neighborhoods — most of whom haven’t always considered themselves activists — have joined the struggle for educational justice against the dire conditions that budget cuts, layoffs, and closures have imposed on the city’s schools. I spoke with Raise Your Hand member Vanessa Caleb — a mother of three children, two of whom are Chicago Public Schools (CPS) students on the city’s North Side — to talk about this politicization, the state of CPS, and how she has engaged with the fight for quality public education in Chicago. Where do your kids go to school? What neighborhood do you live in? What organizations are you involved with? I grew up in Evanston, Illinois in the seventies and eighties. I went to the Lincoln School, and the principal was named Warren Geary. He helped shape my worldview of what public education can look like in terms of racial and socioeconomic diversity. That was a value of that school system at that time. Now we live in Ravenswood Manor, but Albany Park before that. It’s just three blocks west of where we are now, but a world of difference. I have a fifth grader, Franklin, at Coonley Elementary; he did preschool at Waters Elementary. At the time, we were in the Hibbard School District, west of Kedzie, and Franklin took the tests and did very well, so we were offered a spot in the [selective enrollment] Options for Learning program at Coonley. I have a third grader, Leo. He’s at Waters Elementary and has been since kindergarten. I also have a baby, a one-year-old son. How did you get involved in public education organizing in Chicago? I started getting involved with my neighborhood school, Waters Elementary, where I was a class parent. Then when Leo was entering kindergarten, I had some friends from the years that Frank had been in preschool there. I got involved with Waters Today, which is the school’s fundraising arm, run by parent volunteers. I was very involved for two years, and it was then that that I began to learn more about CPS. It became more personal. A lot of windows opened that I wouldn’t have seen if I wasn’t so deep in it, almost involuntarily. It was a very unwilling and unwitting entrance into this. I was not the type who thought, “I’m just going to get in there and change everything.” I was quite the opposite. I felt more like, “I see someone who’s really in need and hurting, and I don’t feel like it needs to be that way, and I have the time and the inclination so I want to help.” And then it just got bigger and bigger. What motivated you to become involved with Raise Your Hand? I started paying attention to Raise Your Hand on social media. I just reached out to [RYH director] Wendy Katten because I was confused. I was seeing people with some really intense positions commenting on Facebook, and I wondered if it alienated other parents. But I also agreed with a lot of what they were saying. I was trying to find my place. I found out that these positions were not extreme at all. What’s extreme is the dysfunction. How have budget cuts and resource allocation affected schools on the North Side of the city like the schools your children attend? The schools my kids go to are insulated from a lot of these problems because we have parents like me — white, relatively affluent, stay-at-home moms who have the time, knowledge, and skill set to fundraise — and parents willing to give. Not to speak for Wendy, but I know that she similarly got on this path because she started raising money for her kid’s school and then after doing it for a while started to realize that it’s not good enough. In fact it’s widening the gap of disparity. So how has it impacted our community? One thing is the level of stress on parents and families. A lot of that is created just by what CPS spin is generating. Last February, there was a nationwide teacher walk-in, and the CTU put it out there as something that parents — as CPS stakeholders — could do. I picked it up for Waters. The day before the walk-in, CPS put out a letter, signed by CPS CEO Forrest Claypool and Chief Education Officer Janice Jackson, which had a very intimidating tone — a tone that implied that there might be outside elements storming the schools. It was definitely presented as a safety concern. But it was so shocking to me, and it created divisions within my own pretty liberal, progressive school community about whether participating was a good idea or not. The way schools and politics blend together can create a lot of stress for families who are just trying to live and raise their children in a healthy way. The public-relations messaging that comes from CPS creates a lot of that. How have CPS budget cuts impacted relatively wealthy North Side schools and parents, students, and teachers that were relatively stable? Classroom sizes are obviously number one, and that continues to be an ongoing fear. In terms of something that’s tangible, it’s class size. Are our class sizes ballooning at this exact minute? I don’t think that they are. Will they? We’re a neighborhood school; we take everyone who walks in the door from the community. So if we have don’t have money to hire more teachers, it’s just a domino effect. I will tell you another thing I’ve seen. I have a kid in an options program and a kid in a neighborhood program. For the first several years at Coonley, siblings of students in the options program were put on a waitlist to see if they could get in. For several years, no siblings got off the waitlist. But this year, they have. With every one of those new students comes dollars — a lot of dollars. So now if School A starts pulling students from School B, you know School A gets the dollars associated with those kids, and School B loses them. So it becomes survival of the fittest. That’s a very direct effect of the budget cuts. So we have a system where some students get the best and other students are left with less resources, bigger classroom sizes, and so on. At Coonley now you cannot buy a house for under one million, and Waters is getting to be the same way. Waters has a lot more multifamily housing, so I think by default it’ll stay more socially and economically diverse. There’s a correlation between the property values and the neighborhood schools — they become almost default private schools as housing prices go up. Coonley can add a zero to whatever Waters raises because its parents send their children to the neighborhood school rather than pay for private school. So the parents can donate the money they otherwise would spend on tuition to their neighborhood school and get a tax deduction. Since we’re not investing in or creating sustainable revenue sources for the district as a whole, certain schools are becoming prized. The property values of homes within that area then go up and shove out lower-income people, therefore creating less diversity. It’s segregation along racial lines, economic lines, class lines, and, to quote the principal of Amundsen [High School], culturally privileged lines. What’s your relationship like with the Chicago Teachers Union? Has your view of the union changed over the years? So that’s where I’ve landed. I’ve had very smart, progressive friends who still have a nonunion, non-CTU view, which I understand: I have that hesitancy too. I’m certainly a pro-CTU person, but I don’t always fall in line with what the union is doing. You can still support someone and not back them 100 percent of the time. It’s a union of teachers, and these teachers are with my children all day long. They’ve helped my children and me grow. I need them, and they need me — that’s the way I look at it. When you look at the visuals of the April 1 walkout or the strike in 2012, and you see that sea of red, you also see women. And guess what? Most of those women are black and brown. So we’re talking about groups that have been historically valued less. So the woman, the public defender, the progressive in me wants to ally with the CTU. This is a union of teachers who tend to be women, and women of color. Those are the folks I want to be standing with. How have your views of CPS changed or evolved as a result of your activism and increased awareness of what’s going on inside CPS? One thing I haven’t mentioned is how much the schools themselves, despite the politics outside, are thriving, how much success teachers, administrators, and students are having. There are students who want to develop and learn, who want to thrive. Curie High School comes to mind. I don’t know a ton about it, but from my understanding, the students and teachers are thriving. But Curie is also the school where a student was killed while sitting in the back of a car. So these communities have to cope with this duality. We have students and families who are ready to work, learn, play, thrive, and contribute, but our city’s infrastructure is set up in such a way that there’s no money for them. That’s a very painful duality and one I can’t relate to. My life is so easy compared to that. I don’t know that my view has changed, but I guess my humanity toward all those parents, teachers, and kids has become a lot more real. If parents and community leaders continue to organize across the city, what impact could that have on the future of CPS itself, and also on students, teachers, and parents like you? I think as parents continue to organize and dispel some of the myths put out by the city’s PR machines, it can give CPS stakeholders the chance to learn and talk about the issues. I think this kind of organizing leads to transparency and better communication, and hopefully a more equitable disbursement of money, so all of our students’ needs are met. I think parents’ activism will go hand in hand with progress only so long as it goes hand in hand with who we elect as our public servants. Vanessa Caleb is a member of Raise Your Hand and a parent to Chicago Public Schools students. Parker Asmann is an independent journalist from Chicago now based in Medellín, Colombia.